Nutley, NJ, September 24, 2013 – Fauxhemian, A new line from the designers of Schmutzerland was shown off for the first time at the NY NOW gift show in New York City this past August, to rave reviews. Featuring antiqued sterling silver cast settings and glass cabochons this fashion forward collection has a substantial feel, that works well with any type of outfit. With a contemporary look, this line is a departure from Schmutzerland's vintage settings Fauxhemian offers a modern take on the image based jewelry that they have done so well. Bonnie Berish, partner and design director notes, "Our customers have been asking for something that could go with more contemporary looks". She continues, " Thee cast antiqued silver settings are sleek and don't overwhelm your look. They add a great accent to your style". Currently offered in geometric designs, Fauxhemian looks to expand into other styles and colors in the future. Additionally, to go along with the Schmutzerland practice of developing custom lines for retailers, Fauxhemian is customizable as well. Along with an extensive catalog of fantastic designs, Schmutzerland has become known for their ability to listen and create an exclusive line for retailers, museums, institutions and fund raising groups. They have made pieces for the Pennsylvania Ballet, The Mystic Seaport Museum, The Cowgirl Museum and Hall of Fame, many retail stores and private groups. With low minimums it's easy to have an exclusive line developed. Schmutzerland offers their jewelry in 30x40mm oval deluxe necklaces, 25mm round necklaces, oval and round earrings, cocktail rings, petite rings, Brooches, cuff links and hair pins. A truly inspiring story of innovation and reinvention, Schmutzerland is a family owned business started in 2008. Beginning as a web based company, the business now has retailers from Brooklyn to Barcelona, selling imaginative image based jewelry. 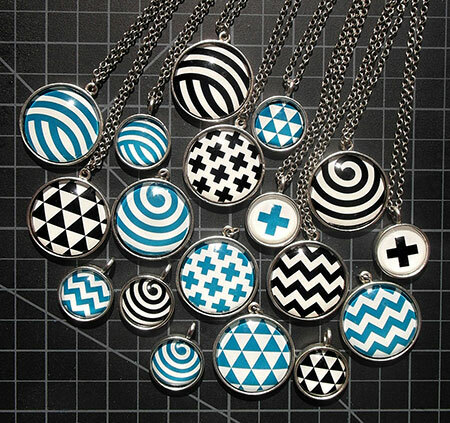 Drawing on a background from a successful career as a graphic designer, Bonnie Berish, principal designer and art director, along with her daughter Lauren, have taken the best of the image collection that she has assembled over the years and created a line of image based fashion jewelry. Schmutzerland has been worn by Tracey Ullman in her hit SHOWTIME series “State of the Union,” written about in major fashion and lifestyle publications and blogs, along with a healthy viral buzz created by satisfied customers blogging, posting on Facebook and Tweeting.